Walking down railroad tracks on a hot Midwest summer day, the tracks would appear to come together at a vanishing point that kept moving farther away, as I approached. And a shimmering mirage of water would float above the tracks, never quite close enough to touch. On either side of the right of way, were awkward, ungainly, beautiful sunflowers, as common as the ubiquitous ragweeds, wild blackberries and goldenrods that surrounded them. Many of the sunflowers were taller than myself. Some were standing at attention, while others were drooping in the hot summer sun. All of them turned their glorious heads to follow the path of the sun. Sunflowers are truly abstract sundials, both by their motion and by the shadows they produce. Tournesol Sauvage! Wild sunflowers, are kinetic art. Later, while hiking through rows of megalithic stones in Carnac, I watched the lengthening shadows they cast as the sun was setting. This experience was repeated often, culminating in seeing the majesty of the obelisk, Cleopatra’s Needle, at high noon. It did not happen over night, but somehow I knew that I wanted to make a sculpture that combined the beauty of a blooming sunflower, and the awesomeness of a man made pyramidal shaped vertical column. In the late ‘90s I made models of narrow pyramids from cardboard or wood. The ones I like best were four-sided pyramids that reversed at each apex. I added color and then reflective materials. Events moved quickly after these experimental maquettes. Soon I was fabricating polished metal structures. My first large scale sculpture, "Tournesol Sauvage!" was made of burnished silicon bronze. It was twelve feet high, consisting of four hollow four-sided pyramids, each 3’high; welded flat apex to flat apex. 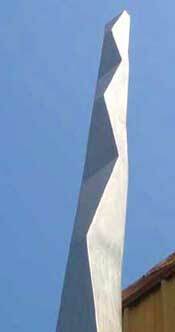 The sculpture reversed directions four times from its base to the top. With its highly burnished swirls on the surface, it appeared to "Sing in the Sun". Photographs of "Tournesol Sauvage!" were added to my web site artnut.com . It did not take long for Mike Lombardo, Mayor of Pittston, Pennsylvania, to find my site while surfing the internet. "Tournesol Sauvage!" is now on permanent display in front of the Pittston City Library. "Heroic Encounter", a 24’ high version , followed quickly, and it too was discovered on the internet by the curator of the Chicago Athenaeum Sculpture Park. It is now part of their permanent collection. "Homage to Brancusi" is a 32 foot high endless column in this same series of sculptures. 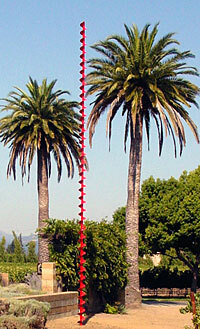 Piero Giadrossi, Director, Chianti Sculpture Park, installed the sculpture November 2001. This world-class sculpture park is located north of Siena, Italy, in the heart of the beautiful Chianti wine district of Tuscany. 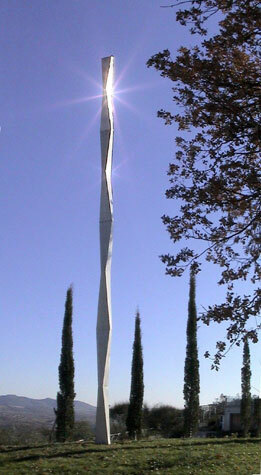 "Polaris and Beyond", my 32 foot high endless column was installed in a northern California private collection. There, in the Sierra foothills, on a wide flat terrace carved out of the hillside, is a forty five foot diameter labyrinth, identical to the one at Chartres Cathedral. Markers on the circumference align through the center, along a south to north axis. 100 feet distant this same axis lines up with At night, this alignment points directly to the North Star, Polaris; during the day, to the snow capped Sierras. Awesome indeed! "Albedo" 32 feet in height, cannot be missed. It is at the entrance to Grounds for Sculpture, Hamilton, New Jersey; perhaps one of the most beautifully landscaped sculpture parks in the world. "Albedo" joined their permanent collection June, 2003. Its highly burnished surface lights up dull winter skies. A spiral can be endless, and leap outward to infinity. In reality, the spiral is a symbol that will end, when it is drawn around a sphere or a donut ring like torus, so that it joins up with itself by spiraling through its middle. This spiral swirling vortex is perpetually turning in on itself, has an interchangeable center and circumference, and has neither beginning nor end. In nature , a tornado, orthe Coriolis Effect of water circling down a drain, are good examples of dynamic cyclic action. My steel spiral augers are of a finite length and fold back on themselves at the top; and come spiraling down on the other side of the auger. At the bottom, this procedure is reversed into the upward direction. The cycling action is continuous. "Jubilee Stomp! " is a recent addition to the beautiful landscaped grounds of St Supery Winery in the Napa Valley. My 30 foot high powder-coated spiral auger greets visitors at the entrance to this grand award winning winery.